It’s hard to argue that Quentin Tarantino isn’t one of the most stylish directors to have emerged in the past decade or more. It’s even harder to argue that his work isn’t instantly recognisable. So we won’t bother with any of that stuff. We will bother, however, with Kill Bill Vol. 1. It’s a film which has more style than an ocean of extra-hold hair mousse – and about as much substance as a drop of water. The latter doesn't matter though, as this paean to cult ‘70s delights ranging from Asian chop-socky flicks through epic Samurai tales through spaghetti westerns and just about anything else available to plunder from the “exploitation” genre is awe-inspiring to behold – even if it is possibly the bloodiest thing to have ever been splattered upon a screen. Quite simply it’s a revenge flick. It all begins when a bloody and beaten character we know merely as The Bride (although we prefer ‘Bleep’, which will make sense to those who have seen or eventually do see it), portrayed in enviously gymnastic style by Uma Thurman, lays in stark black and white, being “attended to” by an unseen “gentleman” clutching a handkerchief carrying the monogram “Bill”. Before the somewhat jarring insertion of a bullet, as good a precursor as anything to the sheer ultraviolence that will follow, we learn that she’s pregnant. 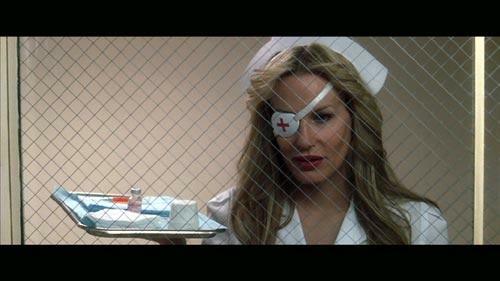 In true Tarantino style we then do a time jump to Bleep, post prolonged coma, exacting much revenge some four years later, complete with shopping list of targets in hand. From here we leap further about in time quite a bit, as she fights them in the ‘burbs, she fights them in the temples, she fights them in the hospitals and she fights them in the snow domes, all in the name of revenge, her lost child and the fact that her entire wedding party were somewhat obliterated by, as we learn, the lusciously and ludicrously named Deadly Viper Assassination Squad (funky acronym and all), a group of which she was formerly a member. "It's mercy, compassion and forgiveness I lack; not rationality." This is where the film’s style really comes to play – visually it is absolutely masterful, even if there are heavy borrowings from left, right and centre. 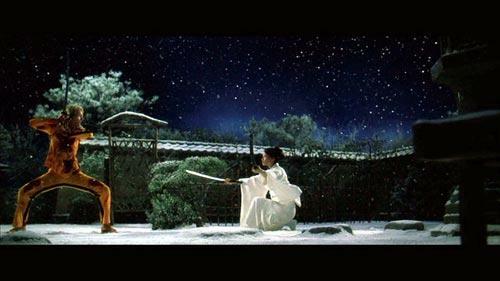 Presented in an anamorphically enhanced 2.40:1 format, Kill Bill Vol. 1’s transfer isn’t necessarily the greatest one ever seen, however much of what many may put down as “issues” seems to be quite definitely included with intent. There are grainy bits (ignoring the glaringly obvious in the stolen introductory titles) and shimmer does occur on the odd occasion, but generally there’s little to find fault with here, even the layer change is perfectly placed so as to shimmy by unnoticed. The cinematography is almost the star of the show; skilful tracking shots, out of the ordinary angles, a nigh-on ten minute anime-ated section and even some dodgy model shots of a 747 which we hope were done in a knowingly naff fashion all look superb, coupled with luscious detail and varying colour palettes throughout ranging from quite dull to eye-poppingly lurid. Player-generated subtitles, which translate the Japanese dialogue through the film in all their tiny yellow glory, can be a little hard to catch at times due to their diminutive size and the speed in which they often come and go, however these appear to be quite faithful to those incorporated in the original cinematic release. Ooh, with Dolby Digital 5.1 and DTS 5.1 tracks on offer, we really are spoiled for choice. It may sound clichéd – although that’s quite possibly remarkably apt considering the filmic fodder in question – but the DTS does win out for an extra almost undefinable oomph in its delivery. However, those without the abilities to call up those three little letters representing supposed extra sonic gusto hardly lose out, with the super-clear DD mix proving almost as good. Ah, let’s face it, most will scarcely notice any difference. Here’s where things become a bit sake – erm, sucky. Mind you, we do receive most of the extra bits Region 1 do; it’s just there’s not much to chow down upon at all - a continuation of the style over substance shtick perhaps? Once ploughing through the ever-so-chic menus, the beefiest bonus is a 4:3, 22-minute featurette, which manages to tow the fluffy line of the majority of such things with a slightly bent presence – possibly solely down to the inclusion of interview grabs from the phenomenally garrulous Tarantino himself. He and some of the cast provide their own insights into some things Kill Bill, along with the de rigueur film snippets and some explorations into the inspirations for the story. Next up are two on-set performance music clips of the over-hyped 5, 6, 7, 8’s; whose appeal just may lie solely in their cutesy Japanese-iness rather than any talent for musical performance. Finally we have the section where our release differs to that of R1, while they get trailers for Tarantino’s entire back and forward catalogue (it includes a teaser for Kill Bill Vol. 2), we only get a teaser and “bootleg trailer” for Vol. 1. Ah, the vagaries of worldwide rights issues… Still, it’s interesting to see how the flick was teased, plus there are odd scenes of a Mr. Miyagi type thing going on which didn’t make the final cut. 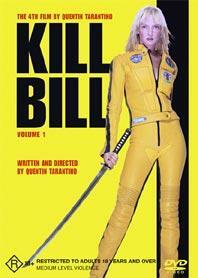 It’s been a long wait between gimps for Tarantino fans, however Kill Bill Vol. 1 doesn't disappoint – save perhaps for the rather sickeningly obvious milking ploy of severing what was meant to be one film into two for added marketing (read ”money-making”) opportunity. Anybody who digs on Q.T.’s established style of pop culture reverence/wholesale plundering will lap this one up – we won’t bother thinking of those of more squeamish constitutions as they’d have given up on him long ago – in what is a well-presented disc technically, even if we can’t help suspecting that the release of Vol. 2 - or even the inevitable ‘Special Edition’ double pack – may be where the decent extras are. "…a film which has more style than an ocean of extra-hold hair mousse – and about as much substance as a drop of water."